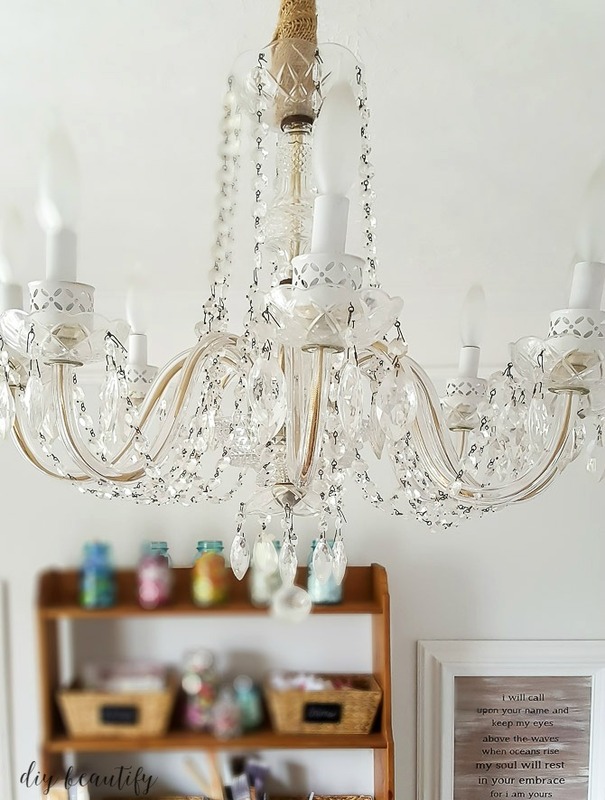 We turned our front sitting room into an elegant and stylish office and craft space with loads of vintage style storage! You know that sigh of relief when a difficult task is complete? That feeling of accomplishment that makes you sit up a little straighter...and brings a big 'ole smile to your face? I'm feeling happy today because my office/craft space is finally finished! This room is technically and officially a dining room. However, it's so small that unless you're a family of gnomes, I'm not sure any dining can take place in here. My new office is just off the kitchen, and gets wonderful light. I was wanting a more grown-up office space to craft and blog in (you can see my old craft area here). Selling the two slip-covered chairs on Craigslist afforded me the money I needed to purchase the new-to-me desk (also on Craigslist). You might remember a post I wrote on affordable desks. I needed something small in this space, and really loved the look of the turquoise one. I was thrilled to find this one as is! No painting necessary!! So let's take a look at what's going on in this room, shall we? Welcome to my home office! This is where I blog, read, craft and generally like to hang out! While the space is tiny you can see that I managed to fit a lot of stuff in here. And that is after I went through and purged my supplies! 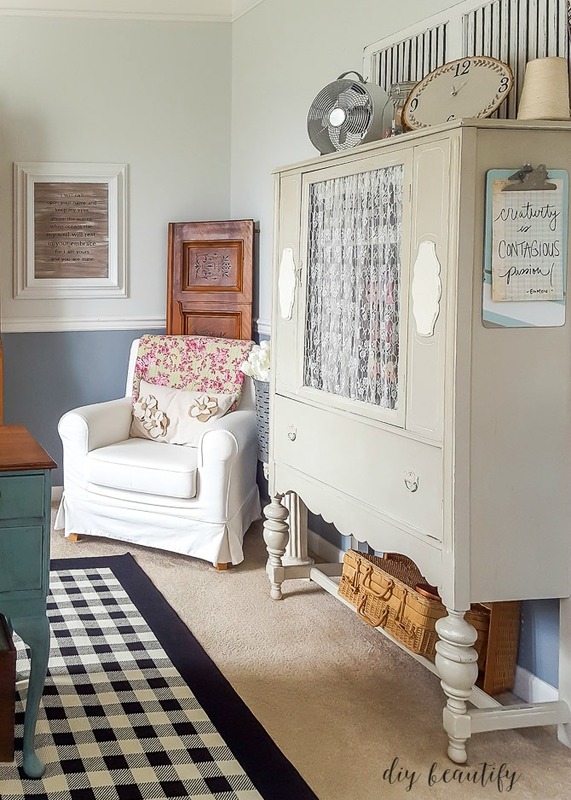 The painted hutch is a beautiful way to hide away craft and painting products. I have my paints in here, as well as other craft supplies. You can go here to see how I organized my craft supplies by color inside the hutch as well as around the room. I've tried to incorporate farmhouse charm into this space as much as possible, without spending a lot of money, so I've re-used things I already had. The panel behind my chair is a piece from our antique piano that I saved. The piano no longer worked and we gave it away to someone who was going to make it into a desk. He didn't need that decorative piece, so I propped it up against the wall and I like how it fills the dead space behind the chair! The other big workhorse in this room is this pine bookshelf. I found it at IKEA many years ago and love the farmhouse feel it has. The shelves hold more craft supplies, again organized by color. 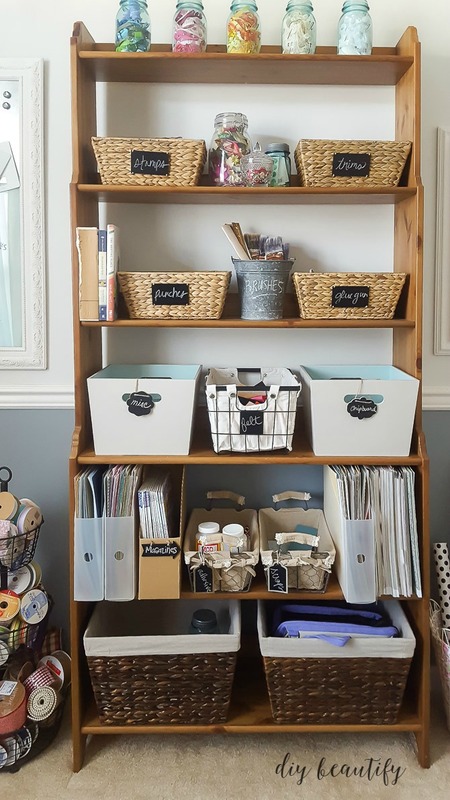 I used baskets with chalkboard labels to make it easy for me to find what I need. I reused a pair of wood crates that were pink toy storage in a former life. You can see how they were updated here. I had difficulty finding the right place to put my turquoise desk. 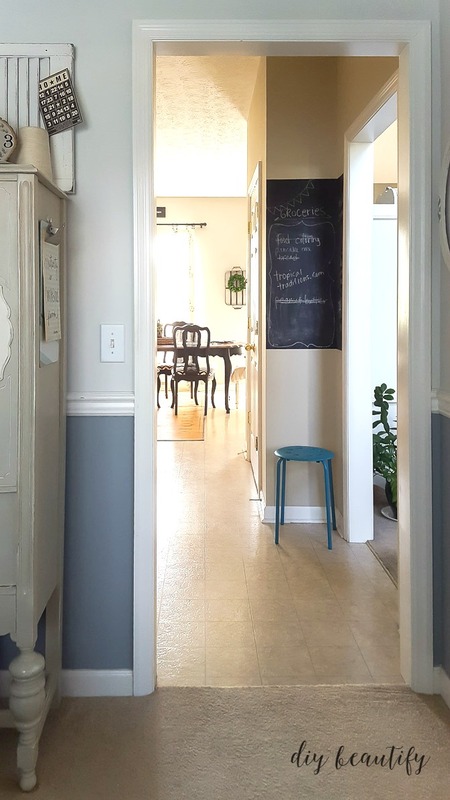 Behind the chair are a pair of french doors, and the wall to the right is open to the kitchen. The main issue was that I didn't want to be looking into the house while I sat at the desk. I knew that I would be distracted and unable to work if I put the desk that way. I liked the desk in front of the window but found I had difficulty seeing my computer screen because of the light, so it had to be moved. Although it's probably not fung shui appropriate, I like it where it is. I have ample light without it being too bright to blog, and I'm able to view both my supplies and my DIY memo board. where I list all my upcoming posts, products to buy, and other reminders. Here's a peek behind my desk. This wall holds my antique window, and I hung some sheer curtains over the french doors to give some privacy. You can see how nicely my area rug stays put on top of the carpeting, without buckling or shifting. That's thanks to this incredible product that I found on Amazon! A comfy chair was a must and this one from IKEA (the Jenny Lund) is small enough that it doesn't stick out too far. It's a great place to relax, read some of my favorite decor books and plan my next project! This vintage chandelier was a score on either Craigslist or Ebay several years ago. My desk may be small, but it has great storage. I was using it for a couple weeks before realizing that the center is also a drawer! Yep, duh! It's large and almost doubles the capacity of what I can store inside! You can see that I'm using a triple-tier basket to hold my large collection of ribbons (at least some of them!). The kitchen is right next door, which is very handy for snacking! I need to be careful about that though; I recently spilled some coffee across my laptop...thankfully it still works! At least it wasn't Coke Zero with cherries!! It would have probably eaten right through my hard drive!! I'm happy to have another room makeover complete! 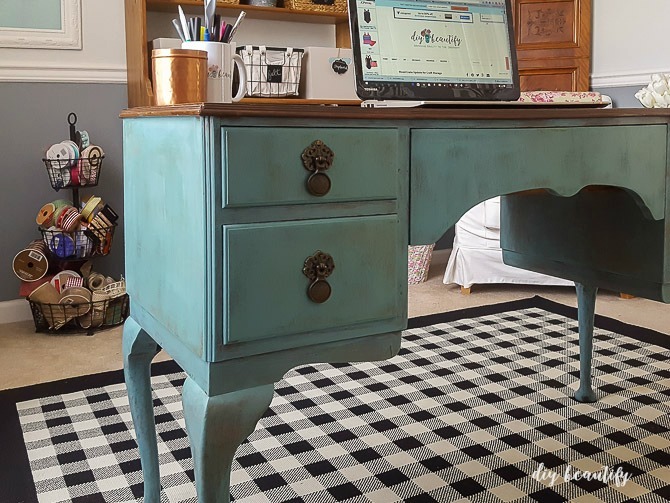 I wish I could tell you that I can now relax and enjoy spending time crafting and blogging in a dedicated office space...but I'm a DIY-er, so there's always another project! Here's a list of all the projects I completed for this office reveal. You can click on each one for more details and a tutorial! 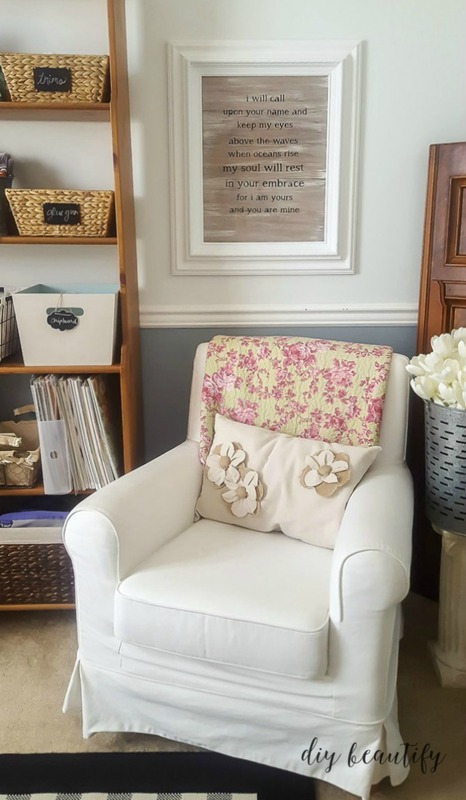 Beautiful craft room Cindy! I love the rug and how it anchors the whole room. Of course there is so much eye candy here. Clever use of objects to collect and organize. I hope you find some time to relax and enjoy that room. If you have some free time pop on by to the newlink party we are hosting Sweet Inspiration, it runs Tomorrow from 9 am est till Tuesday. Thank you so much Mary! It is a fun space to work in, and I'm so thrilled I could accomplish so much on a tiny little budget. I think I spent less than $100 in this room just by re-purposing items and shopping my own home! 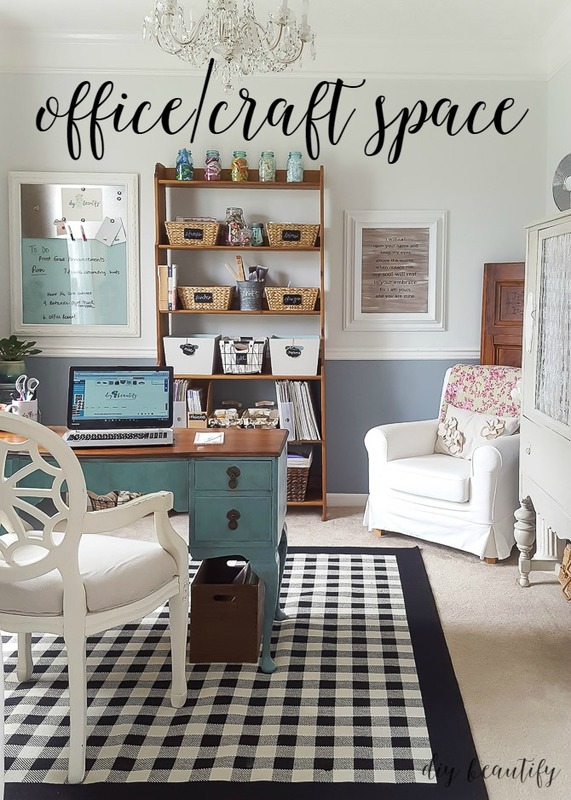 Very beautiful office/craft room! It is amazing what you were able to do on such a small budget. And I love how organized everything is. I love it all! Brooke, thank you so much for your sweet comments today about my home office/craft space reveal! Hopefully I can keep it organized, lol! Oh Cindy! I adore your new space. It is so light and bright! Just perfect for creating and planning and dreaming! Thanks so much friend! I totally agree, and am really enjoying this space all to myself! YAY! I was so excited to see your fabulous Home Office Makeover this week! Thanks so much for sharing your creativity at the The DIY Collective! Please join us this week to show off your latest project! 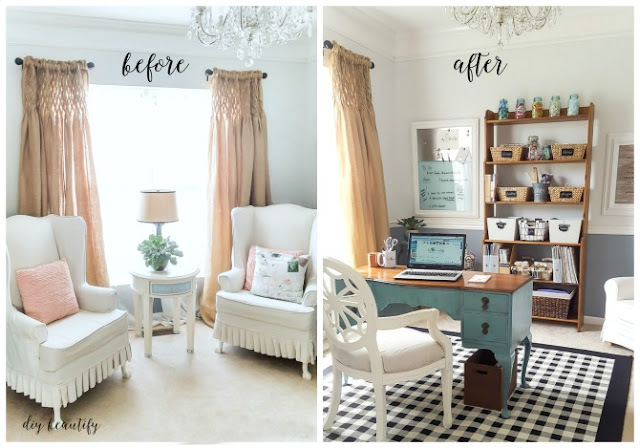 Your office/craft room make-over looks fabulous Cindy. I believe creative spaces have to be inspiring to spur on our creativity, so this room must be so lovely for you to work in. Thank you for sharing your make-over with us at Shabbilicious Friday. I'm delighted to be featuring your craft room at tomorrows party. You are so right Kerryanne, and I finally have a space to work in that inspires me! Thank you so much for featuring my space tomorrow! This space is just beautiful! So organized and inspiring! Thank you Colleen, just hope I can keep it that way! 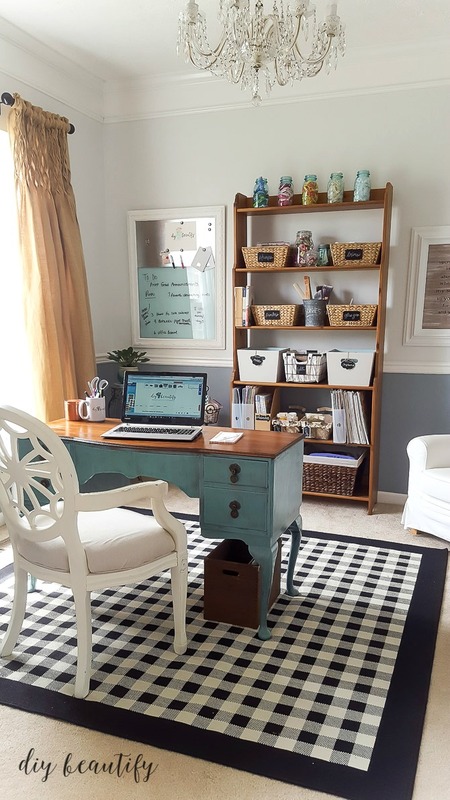 Wow, what a beautiful and wonderfully organized space, Cindy! I love the soft colors and all the texture. And the rug really does ground the space so nicely. Featured at Be Inspired this morning. Thanks so much for sharing! Wow this space looks wonderful! You did a great job, I love your taste. Wow! I am impressed. We changed our dining room into an office/craft space as well but I am still trying to figure out storage. I think a large purge is in order. I love the hutch, the desk and the ribbon storage! So pretty! That looks great! And I'm sure your room will get more use now that you've changed it. I'm wondering where you got your rug? Thanks Jeanette, the room is much better suited to our needs, and I love spending time in it! The rug is from IKEA, from a few years ago, but I think they still sell it. I love your office space. I am in the midst of redoing my office. 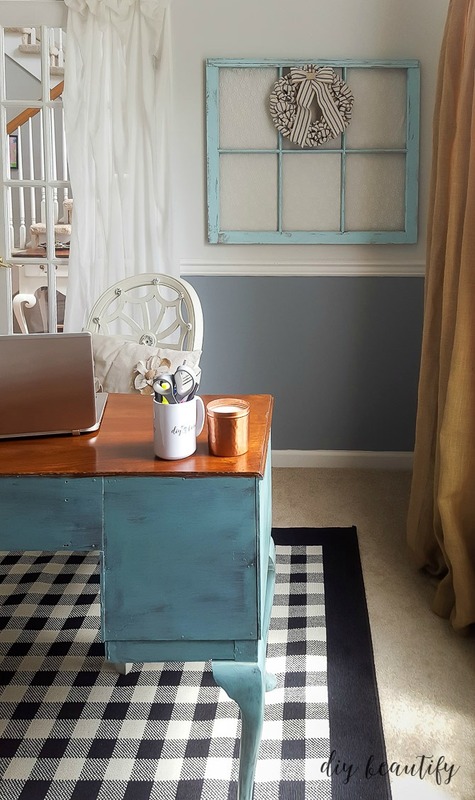 I have an old desk that my husband redid for me two years ago and now the color does not go well with the freshly painted grey walls. Can you tell me what color you used on your desk? Hi Lisa, first of all, thanks so much...we've just moved and I really do miss this great space! This particular desk was already painted when I bought it. However, it is the same color as one of my favorite chalky paints...Americana Decor Chalky Paint in Treasure. It's a bright turquoise and I've used it on several projects! I love this room! What color paint did you use on the walls? Thanks so much Laurie! I'm sorry but I don't remember the names of the paint colors. We don't live in this house anymore or I could check! Stumbled on this post on Pinterest. Can you tell me where you purchased the curtains? Thanks Carrie, I purchased them from Soft Surroundings, but they don't carry them anymore. They are smocked burlap.